Floating Wood Floors—How are they made? Floating wood floors—shown on the right in Red Oak hardwood flooring—are really built no differently than other engineered wood floors. Both have multiple thin ply layers that are glued together. Both have inner core layers that are generally either a hardwood and/or Baltic birch plywood type of material. Both the center core of either types of floating engineered floors and engineered floors incorporate the tongue and groove system. The top hardwood veneer wear layer is glued and pressed to the top surface of the core and both styles are available in almost any hardwood species and both are available in the different thicknesses. It is simply up to the manufacturer to decide whether or not to allow that particular engineered flooring collection they manufacturer to also be installed using the floating method. Most floating floors (other than the click lock versions described below) can also be stapled or direct glued down over a wood or concrete subfloor. Nowadays, there are hundreds of styles and colors available to match any homes décor. One of the original styles of floating floors was called the “Longstrip” which traditionally means the top hardwood wear layer of each engineered board is made up with a visual appearance of 2 or 3 narrower rows of hardwood within each board, (depending on style chosen). Each board will generally have between 17 and 35 pieces that make up the top wear layer of each panel. You will notice the term “1 strip, 2 strip or 3 strip” shown in our image below. These boards themselves depending again on style chosen can be anywhere from 3–8 inches wide and the longest lengths anywhere from 4-8 feet long. The 2 Strip design which is being phased out will visually look like two boards side by side on one wide board. The 3 Strip will look like three boards side by side on one wide board. Click Loc Floating hardwood floors are also available in the popular 1 strip style which is simply a single wide plank look. Examples of these 1, 2 and 3 strip styles can be seen here on our Kahrs Original Collection and Boen flooring pages. Because of the gaining popularity of using the floating installation method, more and more engineered flooring manufacturers that previously only allowed their engineered flooring to be direct glued or stapled down are now also allowing their engineered wood flooring the option to be floated. Traditionally, gluing has been the installation method for installing floating floors by applying a bead of glue to the grooves on the edges of the boards during the installation process. Applying too much glue in the grooves can cause the glue to squeeze up and onto the top of the floor when joining boards together. If that should happen simply take a damp paper towel or cloth rag and wipe off any excess glue before it dries. All floating floors require an underlayment pad to be laid out over the subfloor first. The New Click Lock design is a relatively new innovation in design which has lead some flooring manufacturers to change over their machinery and use this newer patented tongue and grooving systems for floating engineered wood flooring. This type of locking system locks both edges of the flooring together is called the Click Loc system which makes installing floating engineered wood flooring easy, quick and very secure. Click locking the boards together eliminates the need or mess of applying any glue to the grooves of the boards during the installation. When installing the click lock flooring, depending on which style you choose, you either angle the board into the mating end of the boards already installed and fold it down or you lay the board flat on the floor and using a tapping block gently tap the board into the mating board. What are the benefits of using a floating wood floor? The best engineered floating floors will have anywhere from 3-7 plywood like layers of thin sheets of wood, which are then cross layered and glued over each previous layer. This makes floating engineered boards very strong and incredibly stable. In addition, being less prone to expansion and contraction, floating engineered flooring is a great choice to use in summer homes where the heat is turned lower during the off season when no one is there. They are also beneficial in areas of the country with more drastic humidity changes because they are not attached to the subfloor at all, therefore allowing freer constant movement (expansion and contraction). Floating floor boards are connected to one another (either by glue or by a click locking tongue and groove). Once these boards are connected, they become a single unit and when expansion and contraction happens, it happens as a whole. This minimizes gapping that you would see in a traditional installation (nail or glue down), where each board is expanding and contracting independently of the other boards. It is important with floating floors to leave an expansion gap around the walls of the room and around any other immovable objects which could cause an obstruction to the floating floor’s natural expansion and contraction. These expansion gaps are typically covered by a Quarter Round molding or a Wall Base. Changes in seasons bring changes in relative humidity levels. Since wood flooring is a naturally porous material, when there is more moisture in the air, the wood will soak this up and expand. When the atmosphere around the wood flooring dries out, the wood will lose moisture, causing contraction. With solid hardwood flooring, prolonged drastic seasonal changes can wreak havoc in a home without some type of relative humidity controls and could cause extreme expansion or contraction, ultimately leading to cupping or gaps between the boards. A floating engineered floor is favored in regions with these extreme changes in humidity. Floating engineered flooring is also beneficial in basement installations because of this increased stability in higher moisture environments. Floating engineered floors can be installed on any level of the home (Above, On or Below grade level). In addition, most manufacturers of floating engineered floors allow their floating floors to be installed, in addition to over plywood and concrete subfloors, over untraditional subfloors such as tile, other wood flooring or vinyl. Floating engineered floors are also the best option available for installation over radiant heat, as stapling over radiant heating systems could puncture and damage the system and direct gluing down flooring over radiant heating systems can adversely affect the radiant heating tubing making any later repairs impossible. Most manufacturers will require that the floating installation method be used over radiant heating systems. As floating engineered floors become more and more prevalent in today’s market, more and more manufacturers are creating lines of floating engineered flooring. Just like in solid and regular engineered lines, floating engineered floors come in a wide variety of colors and wood species, both domestic and exotic. Depending on the manufacturer’s given wear layer thickness, you can also sand and refinish floating engineered floors 1 to 5 times, professionally, over the life time of the floor. This adds to the appeal of floating engineered floors, as the ability to sand and refinish means added years to your floating engineered floor. Depending on the amount of wear and tear the floor gets, a floating engineered floor should last anywhere from 40 to 80 years before needing replacement. One of the major benefits homeowners reap from floating engineered floors is the ease of installation. To save money, many homeowners are turning to DIY home repairs and installations, and flooring installation is no different. Floating installations are the easiest installation methods for a non-professional to do, especially floating engineered floors with click locking tongue and grooves. 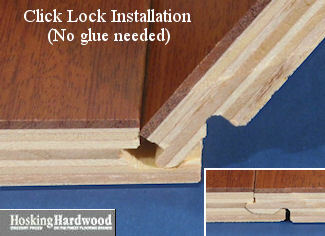 Click lock tongue and groove collections require absolutely no glue, as they just click together and lock into place. If a board gets damaged later on, the flooring can be un-clicked back to where the damaged board is and easily removed and a new board inserted. Engineered floating floors are also manufactured two ways, one having a Sliced (sawn) cut where the hardwood wear layer is sawn like regular lumber which shows finer graining. Sawn is the more expensive way but it shows the truer look of the wood graining. Floating Wood Flooring wear layers can also be Rotary cut, which the veneer hardwood wear layer is peeled off the log using big lathes. This peeling method shows dramatically wilder graining. Q. What is the advantage of using a Floating wood floor over a Solid nail down floor? A. Most floating floors can be installed in a basement area where a 4-6 mil plastic vapor retarder is desired or installed for a cleaner installation over radiant heat systems. Floating floors can even be floated over most flat and well secured ceramic tile. The Click Loc installation style makes the installation fast and easy. Q. Can floating wood floors be sanded and refinished new again if it ever needed to be? A. Floating floors can have wear layer thicknesses anywhere from 1mm (approx 1/32) to 6mm (approx 1/4) inch thick, wear layer thicknesses over 3/32 of an inch thick can usually be sanded and refinished new again if done properly. Floating floors which have a thick wear layer of 1/8"-1/4" inch thick can be sanded and refinished new again up to 2-5 times these floors can last 40-80 years or more. Q. Does it matter what size board or color to use? A. I would suggest using whatever width board you prefer aesthetically. The rule of thumb is that a narrower board will give you a more formal look and feel to your home. A wider board (over 4 inches wide), will give you a more Country look and feel and some are even offered in the handscraped wood floor look. Floor Color is a personal choice that would have more to do with your personal tastes and decor. A natural light colored wood floor will go with any décor and will lighten up any room. I usually suggest not using dark colored flooring if your room decor is very dark or very small as it will make the room appear smaller. Q. Can I use a Floating wood floor in my basement? A. Yes, floating floors were designed for basements and or other areas of the home that are prone to having higher than normal moisture levels. Q. Are Floating floors noisy when they are walked on ? A. Not necessarily, but there are several things you can do to maximize sound control when using a floating floor. The thicker the flooring, is the more sound control you will have. Purchasing the best underlayment pad like Silent Stride will also greatly help dull any noise transmission. Using 1/4" cork underlayment is the ultimate in sound control. The flatter the subfloor is will reduce any hollowness within the floor. Q. Can I install a Floating floor over other floor coverings such as vinyl or tile? A. Yes, as long as the other flooring is a hard surface, secured well and is flat. You cannot install any type of wood flooring over carpet. Q. I pulled up old carpet and there is Particle Board underlayment that I do not want to take up. Can I install a floating engineered wood floor over it? A. Yes, Floating floors are the only hard surfaced flooring that can be installed over Particle Board, as it is not a suitable underlayment that other flooring can be nailed or glued to. Q. Can I glue down a Floating wood floor over my concrete slab? A. Some manufacturers of engineered floating floors also allow their floating wood flooring to be direct glued down. You should make certain that your slab has had a history of being dry and that the moisture content does not exceed 4%. Click Loc flooring should only be floated. We show the most up to date product specifications which includes Installation methods next to each style of flooring within our products pages. Q. Are all Brands of Floating floors the same? A. No, like anything else you purchase there can be big differences in quality. Some manufacturers use a lower quality wood along with low grade, cheaper bonding glues for their ply layers. Their milling could also be off and their finish quality could be poor. Q. Are there different styles of Floating Engineered flooring? A. Yes, aside from their smooth surface styles some wood flooring manufacturers also produce character or hand scraped versions that are available, which would show more light and dark boards along with more pronounced character—with the possibility of small pinholes and knots. What is extremely popular nowadays is a rustic or Common grade. Q. Can I install my own Floating Wood Floor? A. Yes, installing prefinished wood flooring is very easy. If you can measure a board, cut and glue or Click Loc it to another board, then you can install our hardwood flooring. It is an easy and rewarding way to save a lot of money by doing it yourself. Our flooring comes with easy to follow instructions. Standard tool knowledge and common sense would naturally help. If you purchase your flooring from Hosking Hardwood Flooring, we gladly take the time to walk you through your installation. Q. How much flooring do I need to order? Why do I have to add 5% to my square footage? A. See our Measuring Tips page. Manufacturers recommend adding 5% to your actual square footage. This added 5% is recommended to cover boards that you may not want to use that may have gotten by the inspection process at the factory and for cutting and fitting waste. An increased waste factor of 10-15% may be needed for lower grades of flooring for more information see Customer Expectations. An increased waste factor of at least 15% is required for cutting waste created by installing the flooring at a 45-degree angle in the room. Q. What tools am I going to need to install a Floating wood floor? A. Some flooring styles may require more or less tools that are mentioned here but generally you will need some small basic tools such as a Tape measure, Combination Square, Power Miter saw or Hand saw, Hammer, Jig saw, small portable table saw, a pull bar, a few packages of small wood shims and a tapping block. Q. What are the benefits of using Prefinished flooring rather than Unfinished flooring? A. Purchasing prefinished flooring eliminates the time consuming chore of the sanding and refinishing and gives you the added benefit of a perfect finish all done for you at the factory. Most of the brand name manufacturers carry a variety of stained colors to choose from and are coated with a durable 7-10 coats of the Aluminum oxide finish, which are far more durable for wear than anything that can be purchased in a hardware store, or home center. Using prefinished flooring allows you to move right back into the room after installation. No waiting for days while the finish is being applied and drying! Remember: Even the best wood flooring will react to the presence of moisture. In the dry winter heating months, moisture leaves the wood causing the floor to contract, which can leave unsightly gaps between each plank. In the summer months when the humidity is higher the wood will absorb excess moisture and expand and the gaps will disappear. If there is too much moisture it may cause the wood planks to cup, or buckle. This is why it is important when installing a wood floor to acclimate the wood to the home from 4 to 7 days or more prior to installation and to leave the proper expansion gap around the perimeter and at all fixed objects. It is also important to keep the home's relative humidity level at between 30-50% or what the manufacturer recommends. Doing this will help minimize any movement within the wood flooring later. The best floating floors have a Lifespan anywhere from 40 to over 80 years. Using a floating floor allows you to have a wood floor on any grade level. Floating engineered wood floors are built to better withstand higher than normal humid regions of the country. Floating wood floors allow you to float the new flooring over wood subfloors, including particle board underlayment, concrete slabs and other, well-secured types of floor coverings including ceramic tile. Floating wood floors are very easy and fast to install. Longstrip Floating wood floors are usually available in longer lengths than standard engineered flooring. Engineered Floating floors are usually less expensive than a high end engineered flooring. Most Floating floors can be sanded and refinished new again if needed. Hardwood flooring does not cause allergies, in fact hardwood flooring is highly recommended to use by allergists. At Hosking Hardwood Flooring we only sell 1st Quality Hardwood Flooring—we do not sell 2nds, or mis-milled flooring. See JEFF HOSKING'S BRAND RATINGS: next to each product style collection within this site. What about resistance to water? Can your floors be washed with soap and water or do they tend to imbibe the water and swell? My current lower end laminates require special cleaning agents so warpage is minimized. Also, how well do your floors stand up to office chairs on rollers? Such an informative article, thank you for explaining the "why" and "reason" for the different aspects of choosing and installing floating wood floors. Very informative and detailed. Just what I needed. Really great article and very inclusive on the pros of floating floors. One thing that I was looking for was the lengths of floating floors before a transition piece is recommended. The transition pieces are kind of a barrier to having a continuous and uniform look in long or wider rooms. I still havent found my answer but I will keep searching but your article included just about every other facet to consider before making a large investment such as flooring. thank you.